Leigh LaCognata, a Registered Dietitian since 1997, has been writing articles professionally since 2010. She has worked in various health-care settings, led classes and given presentations on diabetes, weight loss and other nutrition-related topics. LaCognata holds a Bachelor of Science degree in nutrition and foods from Auburn University and a Master of Science degree in poultry science. Vitamin K and the mineral potassium often are confused due to the chemical symbol of potassium being "K." Vitamin K and potassium have very different functions in the human body. They are found together in some foods, but high vitamin K and high potassium foods usually differ. Vitamin K is a fat-soluble vitamin absorbed into the body and metabolized similarly to fat. It has several functions but serves mainly as an enzyme required for the formation of prothrombin, used for blood clotting. Many people take anticoagulant medications, or blood thinners, to decrease their risks of stroke or deep vein thrombosis, which are caused by blood clots in circulation. When taking anticoagulants such as warfarin or coumadin, vitamin K in the diet can decrease the effectiveness of the medication. Health professionals recommend that you consume consistent amounts of vitamin K to maintain consistent clotting time in your blood. Vitamin K is found mostly in green leafy vegetables. The average intake of vitamin K in adults is 70 to 80 micrograms per day. The recommended intake for vitamin K, known as the percent daily value, is 80 micrograms. A high vitamin K food is more than 200 percent DV. If you're taking anticoagulants, avoid or limit foods from this group to one serving daily. These foods include cooked kale, spinach, turnip greens, collards, Swiss chard, parsley and mustard greens. Moderately high vitamin K foods are 60 to 199 percent of DV. These foods include brussels sprouts, raw spinach, raw turnip greens, broccoli, endive and green leaf and romaine lettuce. 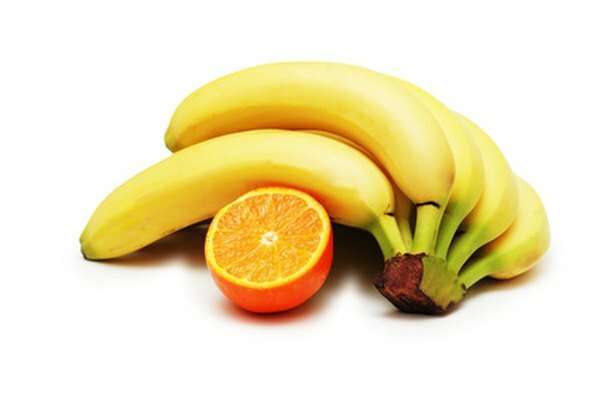 Potassium has two main functions: It works with sodium and chloride in the osmotic pressure and acid base balance in blood and cells, and it works with other minerals in muscle contraction, particularly in cardiac, or heart muscle, contraction. Many people have difficulty maintaining normal levels of potassium. If you are taking diuretics for fluid gain such as lasix or furosemide, your body loses potassium when you lose extra fluid through urine. In this case, high potassium foods or supplements can be consumed to maintain normal levels in blood. Potassium also can be difficult to control with kidney disease, as this is one mineral regulated and excreted by the kidneys. When kidney function worsens or dialysis is required, potassium intake may need to be decreased to maintain normal blood potassium levels. Potassium is highest in many fruits and vegetables, including bananas, oranges, orange juice, raisins and other dried fruits, watermelon, peaches, prune juice, tomatoes, tomato juice, potatoes, sweet potatoes, spinach, winter squash and pumpkin. Milk and dairy products have higher levels of potassium. Lower potassium foods include apples, grapes, lemons, limes, cranberries, blueberries, blackberries, canned fruits, pears, cucumbers, lettuce, eggplant cauliflower, cabbage, carrots, okra and summer squash. Modern Nutrition in Health and Disease; Maurice E. Shills, et al.